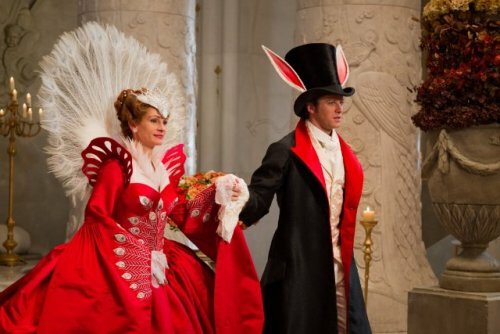 Nominated for Best Costume Design (Colleen Atwood) and Best Visual Effects (Cedric Nicolas-Troyan, Michael Dawson, Neil Corbould, Philip Brennan). 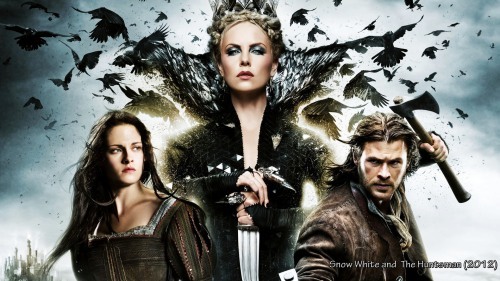 Snow White and the Huntsman is an entertaining film worthy of its nominations–no more, and no less. Recently we have been treated to new spins on old tales and for the most part, this rendition of Snow White is pretty good. Snow White (Kristin Stewart) is supposed to be incredibly beautiful, not just in appearance. Her mother the queen was well loved and poured that love out to her daughter. When the queen dies, the king remarries (fairly quickly) to an incredibly beautiful woman who kills him immediately and takes the throne. 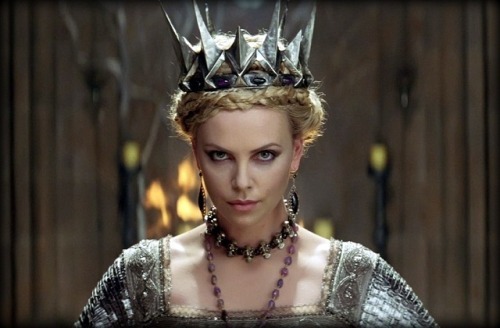 Ravenna (Charlize Theron) is perhaps the best part of this film. She clings to her beauty and must take the youth of young virgins in order to maintain it. Otherwise her skin sags, her hair thins and grays, and she loses all beauty. Her magical mirror informs her always what she must do to remain the fairest in the land. Snow White is kept prisoner in her own castle and when she comes of age, she must escape to save her own life. The Huntsman (Chris Hemsworth) is brought before the queen and ordered to track Snow White and bring her back. This is the twist of the film–the Huntsman has a strong part to play, and he soon falls under the charm of Snow White, just as the dwarves and other rebels of the land. In this rendition, there is still an apple and a prince charming, but there is also war and evil knights made of glass shards. As much as I loved this movie, I would not give it five stars. Charlize Theron was brilliant, although I think she was riding the edge of the knife between “perfect crazy” and “too much crazy” the whole movie. A lot of the focus of the film was displaying just how crazy she was. I did love, however, how discontent she was. From fits of rage to silent tears, her range of emotions was amazing. Another downer was, of course, Kristen Stewart. To be honest, I do think she’s pretty–not necessarily fairest of the land pretty, but pretty. Her method of acting came in handy when it came to her wandering through the dark forest. She was confused, scared, disoriented–I think she played that part well. I also thought she did a good job during her monologue at the end. However, I did not have much faith in her character. She not only represents life, but in actuality IS life. Snow White was a challenging character in comparison with Bella from “Twilight,” but I do not think that Stewart pulled it off. She was not believable as Snow White. 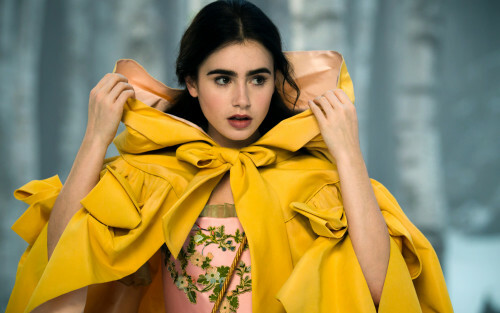 She was instead a girl running around in a big medieval dress, trying to be a great beauty. Snow White is supposed to capture everyone’s heart, but Kristen Stewart did not capture mine. My personal favourite was, of course, The Huntsman. Chris Hemsworth–tall, muscular, brunette (yeah, I missed the blonde hair too), and with a Scottish accent. Whether you are male or female, you should have a crush on this man. I thought he did a good job with “Thor,” but when he did his monologue in “Snow White,” I could tell we are going to be seeing good things in his future filmography. Hopefully he will not just be the brawny action star who plays the same role all the time. I loved the special effects. I expected more of the glass-demon knights we all saw fighting in the previews. I was a little disappointed they had such a small role. I didn’t notice the editing, which must mean it was good because trust me, I notice when it is bad. The symbolism was blatantly obvious–death versus life, red apples being eaten, etc. I liked the cinematography. I think my favorite aspect was probably character development. Before the end of the film, I knew who each of the characters were and understood their decisions. We were given enough information about their pasts to understand their present. While rooting for the good guys, I had a sick desire to see the queen succeed because Theron captured me with her crazy ways. If you are not looking for a deep film, or even a frivolous film, I would definitely recommend Snow White and the Huntsman for a Friday night entertaining movie. It is rated PG-13 so it is certainly not as kid friendly as the original Disney animation, but other than that it is a good family film.